The astounding techniques that the ancient cultures applied are being kept and adapted by artists today. The result is pieces that have reached a perfection state such as Chulucanas ceramics, painted glass, textiles, portable altars (retablos), and jewelry, all hand-made and representing the cultural expressions of the different regions of the country. Peru owns a millenary culture; a vast wealth that remains preserved and that expresses itself through the hands and creativity of its artisans. The pieces are associated to their own styles as well as to techniques adapted to the new market trends. It is estimated that about 100,000 artisan workshops exist in Peru employing more than 500,000 people. Thus, it is possible to find a mosaic of products of a wide variety of colors that differentiate among themselves depending on the regional identity and the creativity of their makers. The production processes of some objects have been mechanized but they conserve the essence of tradition notwithstanding. White, shining, ductile and malleable, a little harder than gold but softer than copper, silver is a mineral which due to its relative abundance in Peru has given place to the development of an artistic production of extraordinary aesthetic purity, diversity, and richness. Building on the legacy of the ancient Peruvians, silver jewelry has become a very dynamic sector in recent years. Its catalogue consists of designs and models thaat not only emerge out of the creative originality of local artists but also respond and adapt to the requirements of the international trends. The production of this artisan category comprises the creation of unique pieces decorated with gemstones and semi-precious stones. Among the main kinds of jewels made, those worth mentioning are bracelets, necklaces, earrings, and other accessories. 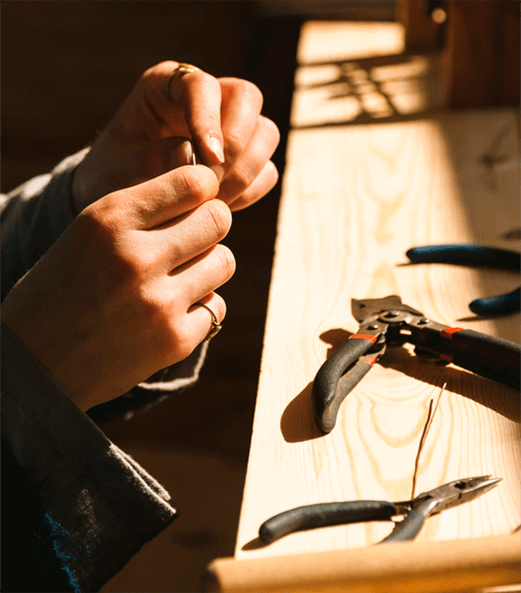 Anyone who has the opportunity to watch the production of furniture and decorative objects made out of wood will appreciate the detailed work put on by the Peruvian artisans who elaborate them. Beds, tables, and cupboards turn into objects that, even though remain utilitarian, are truly works of art. They are hand-made out of several tropical lumbers, which are obtained through extraction processes that secure the sustainable management of forests and which are characterized by their length, density, and resistance. Peru is carrying forward a strategy aimed at diversifying the use of lumber species and thus increasing the availability of products for the international market. Besides cedar and mahogany, 32 other timber species have been identified as alternatives among which cachimbo, capirona, copaiba, tornillo, and South American sapote deserve to be mentioned.